Are Newspapers Civic Institutions or Algorithms? 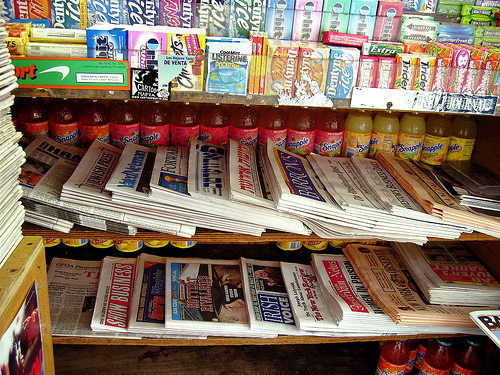 Since 2007, the newspaper industry has taken a massive hit, and remains more uncertain than ever. Dominic Basulto sees the news industry as becoming more and more algorithmic, as a result of “appification.” Instead of paying to read an entire issue of The New York Times (which looks the same to every reader), people can use apps that will determine what they are more interested in, and direct them toward that information specifically. The Web is becoming increasingly personalized, and advertisers and search marketers need to adjust. Carrie Ferman says, “The personal web is about delivering the right information to each consumer at the right time, to the benefit of both consumers and businesses.” Consumers now expect their interactions online to be tailored to their specific needs and interests, and will often shun messages that aren’t relevant. How can your business keep up with this trend? Research Your Audiences. Understand the demographics of your followers, their favorite platforms, their search patterns, and more. This information will help tailor Web experiences as much as possible. Make your homepage versatile. Avoid static content and opt for frequently updated content, as well as including different media from images to audio to video. Encourage feedback. Allow your readers to contribute and comment, and constantly seek feedback from them. Make sure your content is complete, and that all information is naturally easy to find. Target your content toward the specific audiences you want to reach. Draw followers out by highlighting interests and passions they might have. Why Should You Conduct a Full Link Audit? Conducting a thorough link audit — i.e. determining where your backlinks are coming from — is a time-consuming process, but it can help you shape your link building efforts in the future. Nick Stamoulis suggests going beyond gathering the quantity of links and exploring the quality and source of those links — from comments and directory links to editorial citations and press release links. “Visiting each of the links in your link portfolio can also give you a good idea of where the holes are in your link building campaign and where there is room for growth,” Stamoulis says. An audit can help you fill in the gaps in your campaign and diversify your content. This article kicks off a four-part study on content creation and the emergence of the Internet as a visually dominated medium. The first part of the series looks at Facebook, and how Web users today have become familiar with content creation through their Facebook pages. According to Matthew Carrol, the Internet has become so content-laden that people are using images to help sift through information more quickly. “This is changing how we relate to and interact with the web — it’s becoming intensely image-based & visual — which is a good thing,” Carrol says. Facebook has consistently embraced this trend with new features, like Timeline, which visually breaks down a profile with images, instead of relying heavily on text. Ardath Albee reminds us of the versatility a blog can bring to your content marketing efforts. More and more businesses are tapping into the power of a solid blog. “According to the B2B Content Marketing: 2012 Benchmarks, Budgets and Trends report produced by CMI and Marketing Profs, the use of blogs has increased to 65% from 51% in 2010,” Albee writes. Create a newsletter. Pick your top blog posts and email them out in the form of a newsletter. Embed videos, photos, audio files, and more. Float ideas and test them out on your readers. Fuel social media, and break down your posts into Facebook and Twitter material. Expose thought leadership by interviewing experts or inviting them to write a guest post. Spark conversation by inviting comments as much as possible. Image by Susan NYC (Susan Sermoneta), used under its Creative Commons license.